They say it's not the heat, but the humidity. Well fret not, because the versatile Timex TX5170 electronic thermometer displays both at the same time. The compact unit--which sits unobtrusively on a desktop, table, or shelf--sports a three-line LCD panel with bold, conspicuous readouts. The top line displays the indoor temperature, the middle line displays the outdoor temperature, and the bottom line shows either the indoor relative humidity or the time, depending in your preference. As a result, you can instantly gauge whether to wear shorts or pants on a seemingly mild summer day, make sure the humidity level is correct in the greenhouse, or crank the air conditioner as the afternoon progresses. The temperature readings range from 32 to 122 degrees F (0 to 50 degrees C) for the indoor temperature to -4 to 158 degrees F (-20 to 50 degrees C) for the outdoor temperature. The relative humidity, meanwhile, is measured on a scale of 20 to 90 percent, with the hygrometer performing best between 40 and 70 percent. The display is remarkably easy to read--even from across the room--thanks to the bold digits and crisp readout. At the same time, the TX5170 includes an integral minimum/maximum memory function that records the high and low temperatures of the day. The values are available at the push of a button, with a second button clearing and resetting the memory on command. Best of all, the unit is notably compact at 2.88 by 5.44 by 0.81 inches (W x H x D), making it a great choice for home offices, backyard greenhouses, and everywhere in between. The TX5170 comes with a wired, weather-resistant temperature probe (with a 10-foot cord) for gauging the outdoor temperature, along with an integral folding stand. Because of the wired probe, the main unit will need to located near a window to enjoy the outdoor temperature functions. And should you want to mount the unit on a wall rather than place it on a shelf or desk, simply suspend it from its rear hanger hole (you'll need to provide the nail or screw). As a final bonus, the TX5170 is streamlined and attractive, with a sleek white plastic housing and a snazzy seven-button control panel on the front. The TX5170 requires a single AAA battery (not included) and is backed by a one-year warranty. Base station, wired weather sensor with 10-foot cord, integral folding stand, user's manual. Top window shows indoor temperature. Middle window shows outside temperature. Bottom window shows both the humidity reading or the quartz clock. Temperature range indoor thermometer - 32�� to 122�� Fahrenheit. Outdoor Temperature range -4�� to +158�� Fahrenheit. Fahrenheit and Celsius thermometer scales. Easy to use set buttons in classic new style. The LCD clock has AM/PM icon. Records Minimum and Maximum temperatures for both indoor and outdoor thermometers. Ten foot all weather temperature sensor. Case molded in durable plastic and finished in Pearlized white finish. Requires 1 AAA battery. Battery not included. Case size is 5 7/16 and 2 7/8 x 13/16 Backed by Timex one year limited warranty. Works well to monitor a home built incubator. I bought this for my baby's nursery to keep abreast of the humidity level in her room so I know when I need to turn on the humidifier. It works great- it also tells the inside and outdoor temps which are useful, and has a clock. After one week of normal use the Timex TX5170 stopped functioning: The readout displayed random digits. The battery tested fine (1.5 volts on my voltmeter), but I decided to give the TX5170 the benefit of the doubt, so I went out and bought a new alkaline AAA battery and installed it. And, lo and behold, the TX5170 sprang back to life -- for six hours. Then it gave up the ghost completely. Installing ANOTHER new alkaline battery did no good. The online product description states that the TX5170 is covered by "Timex's one-year warranty." That sounds good, only the "instruction manual" included with the unit does not mention a warranty, nor does it provide any contact information for the manufacture. The fine print on the back of the unit itself states that it was manufactured in China for the Maverick Corporation of Edison, New Jersey, and that the name "Timex" is used under license in the United States and certain other territories. I ordered this for my husband and was very disappointed when we went to use it that it was DOA. We tried several different batteries but it was def. not working. We returned it to Amazon only to find out that they no longer have the item available. The first place we used this thermometer, it worked great. We had it on a table near a north-facing window. We passed the wire out the window and attached it to the side of our building with the probe at the end sticking out a few inches from the wall. Temperatures were always accurate, checked with other thermometers inside and out. Humidity always seemed reasonably accurate. We recently moved to a new south-facing apartment. It turns out that if either the base or the probe is in the sun, it will read higher than the ambient temperature. Maybe the reading is correct--the ambient temperature in the sun a few inches from the side of the building is higher than elsewhere--but that's not really useful for us. We're having trouble finding a way to wire the outside probe to have it in the shade. 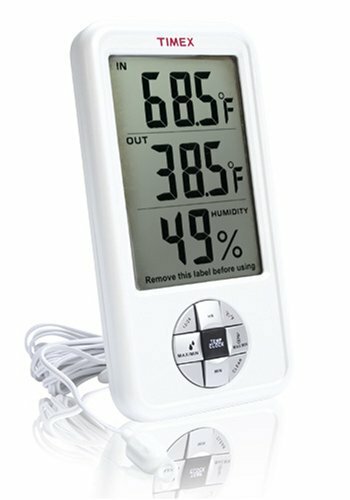 Timex TX5170 Indoor/Outdoor Thermometer - Great Product! Those of you interested in obtaining an indoor-outdoor thermometer please consider this Timex instrument. Simply place a wire out the window below your window where it can't be thrown off by leaking of heat or cool. The Timex is accurate, easy to read, easy to reset, and has the indoor humidity as an extra. I received a wireless weather instrument as a gift. This wireless works if you don't want to place the sensor far enough away from the house to get a good reading--and where no rain can touch it. Pretty hard to place a sensor outdoor completely out of the rain.